1. A hacking, dry cough that lasts from one to three weeks. Note: Dog flu is easily confused with kennel cough. Check with your veterinarian. 2. Your dog sneezing and snorting with green or yellow mucus. 3. Sick dog symptoms like lethargy, tiredness and refusal to play. 5. A fever of over 105 degrees Fahrenheit. Other dog flu symptoms include noticeable difficulty in breathing, dehydration, loss of appetite, a secondary bacterial infection like pneumonia, and what appears to be depression. Dog flu is highly contagious between dogs. 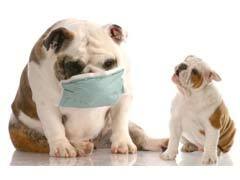 If your dog has dog flu symptoms call your veterinarian. Keep your dog away from other dogs. Wash your hands after playing with or handling your dog. To prevent infection, keep your dog away from dogs that show dog flu symptoms. Dog flu is transmitted through the air. It can be transmitted by sneezing or coughing. It can also be transmitted if your dog touches a surface that was touched by an infected dog. There is a dog flu vaccine. Ask your veterinarian if this vaccine is appropriate for your dog, especially if he comes in contact with other dogs or you take your do to a dog park. Dog vitamins are helpful in supporting your dog’s immune system and possibly preventing a case of dog flu. Dogs with the flu are at higher risk for developing secondary infections and life threatening pneumonia which can be fatal.